Sometimes, let’s be honest, the holidays can really turn into a downer and a lot of the time, we’re just looking for some type of pick-me-up, but don’t go looking for it in holiday movies, especially if they have some of the ‘top’ named actors who you’d never picture spreading holiday cheer. Whether it’s Jim Carrey doing his best Grinch impression in How the Grinch Stole Christmas or Harrison Ford hugging it out with Chewbacca and the rest in The Star Wars Holiday Special, these movies will be sure to make you thankful that you will never watch them again. Jingle All the Way: Arnold Swarzenegger known most famously as the Terminator stars in this family comedy made in 1996 about the commercialization of Christmas. These laughs will have you wishing that you were around Aunt Rhoda when she has a little too much to drink and keeps pinching your cheeks. Think about it. Deck the Halls: This movie will make you just about as uncomfortable as if your dad came down in his underwear and your mom shortly follows in just a robe. Danny DeVito and Matthew Broderick play neighbors who are getting into the Christmas spirit – but not with one another. How the movie works? Not sure, if someone’s made it through this one, buy them a beer. They deserve it. 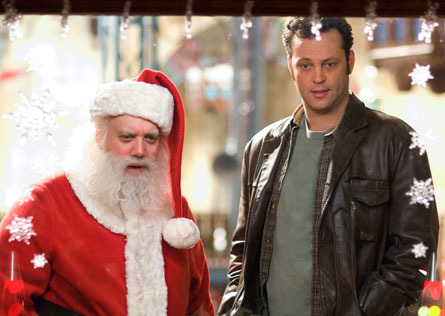 Fred Claus: As we all know, Vince Vaughn isn’t the smallest guy to hit Hollywood being 6’ 5, so why not throw him into a Christmas movie with a lot of vertically challenged elves? Of course it’ll be sure to make you laugh for the first five minutes, but as the movie progresses, laughs become few and far between as Vaughn per usual loses his pride in an attempt to save Christmas. Hero? Hardly. Four Christmases: If Fred Claus wasn’t enough, Vaughn also starred in this one as well, with Reese Witherspoon. They act as a couple and decide it’s time to try to hit up all four houses for Christmas. If you just think about any attempt you’d made like this and would try to turn it into a movie, just picture how it’d look. Throw.away.the.script.now.